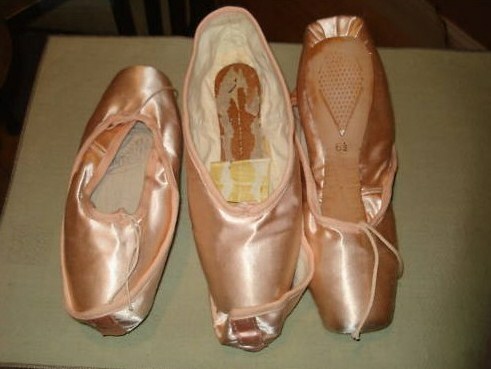 I wish I knew a little more about these pointe shoes, but unfortunately I don’t. This is another brand that does little to no advertising. All I know about them is the fact that they are created by a gentleman named Ushi Nagar who moved to London from his native Africa. They are sold as the Ushi brand and there is little information on other model types. Several of the reviews I have read seem positive, and there are dancers who only wear this brand. I have also read that Ushi Nagar makes most of his models as custom made in the London area. This entry was posted in Mystery Pointe Shoe Brands and tagged Pointe Shoe Brands, Pointe Shoe Images, Ushi Nagar. Bookmark the permalink. Hello. I happened to type in the words Ushi Nagar on Ebay yesterday, and there is an ex dancer selling 40 pairs of them from the US at the moment. I emailed her, telling her there was a bit of interest in his pointe shoes, which she was surprised about,as she didn`t think anyone would have heard of him. She said his pointe shoes saved her career. She told me he used to work for Freeds, then set up his own business,based in London. All she had for him was a telephone number, and she last spoke to him a few years ago, but as far as she knows he is still in business, but is not sure if the phone number she gave me is still the same for him. She is selling them at $25 a pair, and i have to say, they look absolutely lovely.! Just to add, when i have bought my pair and they arrive, i will send you a photo of them, but there is a photo as i speak [as of 27April `12] on the US version of Ebay. Thank you Piggybank40 for the information. It makes me wonder how (or if) all his business is just through word-of-mouth referrals in the dance community around London. I really look forward to the photo! Yes,you could be right about the word of mouth referrals. But this ex dancer is in the States who swears by his shoes,i`m assuming, from his time as a maker at Freeds,then on his own. These are the best custom made shoes. I wore them for years. They also have wonderful customer service. Absolutely loved my Ushi pointe shoes. The broke high under the heal and had nice flat surface to turn on. Customer made, I liked mine tapered down on the sides. They wore like expensive gloves on my feet.